The Race for Arctic Oil: Is Russia Ready to Share? Is the Arctic Headed for Another Cold War? KGB Files: Was Vladimir Lenin Jewish? Only nine months ago, during a summit on Arctic policy in Moscow, Russian Prime Minister Vladimir Putin dismissed the idea of a looming battle to control the Arctic. There was no real reason, he said, to believe in such "futuristic predictions." But a lot seems to have changed since then. As a Russian nuclear-powered icebreaker, the Rossiya, prepared to set out last week toward the North Pole, Putin and his military brass made clear that they are in fact preparing for an Arctic stand-off, which is starting to seem less futuristic by the day. On June 30, a few days before the Rossiya set out to help prove Russia's ownership of about 1.2 million square kilometers of Arctic territory (an area roughly twice the size of France), Putin began the rhetorical salvo during a speech to his political party. "I want to emphasize. 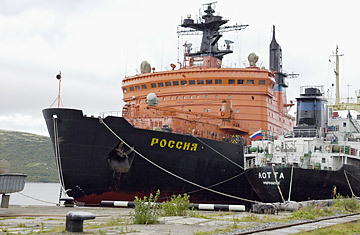 Russia intends without a doubt to expand its presence in the Arctic," he said. "We are open to dialogue with our foreign partners, with all our neighbors in the Arctic region, but naturally, the defense of our geopolitical interests will be hard and consistent." The party elite gave him a round of applause, and the next day, Putin's defense minister, Anatoly Serdyukov, announced that two army brigades, or up to 10,000 troops, would be deployed to defend Russia's claims to the Arctic. This was not the message Putin sent in September, when he invited the world's Arctic decision makers to Moscow for a summit called "Arctic  Territory of Dialogue." At the podium, Putin called the far north a "zone of peace and cooperation," and Russian officials denied that any Arctic troops were being prepared. Many delegates came away confident that the rights to the Arctic could be amicably divvied up, even though about a quarter of the world's untapped oil and gas, as well as everything from iron ore to diamonds, is thought to lie under those melting sheets of ice. By 2014, the United Nations will receive claims for parts of the Arctic from Canada, Denmark and Russia, and will then decide whether the science behind those claims is accurate. But if the claims overlap, it will be up to the countries to figure out how to share. "So the Russians are already laying down the ground rules," says Rob Huebert, an expert in Arctic military strategy at Canada's University of Calgary. "They are signaling that if anyone wants to make a competing claim, they should expect a very rough ride." In case this was not clear from the comments Putin and his defense minister made last week, the head of the Russian navy, Vladimir Vystotsky, followed up on Wednesday with news of further military build-ups, including upgrades to Russia's Northern Fleet. "Right now a broad spectrum of challenges and threats is being concentrated in the Arctic," he told a conference in the far northern city of Naryan-Mar. He pointed to NATO as the source of the tension, saying the alliance had "marked the Arctic as a zone of its own interests." At the same conference, Deputy Prime Minister Sergei Ivanov, who answers for military affairs, said the voyage of the Rossiya icebreaker and the research vessel it is escorting this summer will allow Russia to make its Arctic claim to the U.N. next year, well ahead of schedule. And Russia does have good reason hurry. Thanks to the rapid melting of the icecaps, new Arctic shipping routes and oil fields are expected to open up in a matter of years, most likely a lot sooner than the northern states can decide who has the right to control them. Even more worrisome is the fact that Russia's neighbors in the Arctic  the U.S., Canada, Norway, Denmark and Greenland  are all members of NATO, Russia's Cold War foe, and most of them have built extensive northern militaries, mostly to prepare for a confrontation with Russia, Huebert says. In May, U.S. diplomatic cables released by Wikileaks also revealed the more cynical side of the West's Arctic ambitions. U.S. diplomats were shown maneuvering for influence in Greenland, and in one cable, Danish Foreign Minister Per Stig Moeller jokes about having "more to carve up" in the Arctic if the U.S. stays away. Meanwhile, new contenders have emerged in the race for the world's last great energy frontier. Since 2004, China has had a research base in Norway's Svalbard archipelago and is now building its first icebreaker, while countries including France, Japan and Korea have been clamoring for a greater role in Arctic affairs. In May, the region's main decision-making body, the Arctic Council, put off discussing whether to allow any other countries to participate. "More voices make things complicated," says Robert Corell, a leading U.S. expert on climate change and the Arctic. "But our Department of Defense clearly sees the Arctic as a potential conflict multiplier, so we are going to have to see more focus on security issues." Incredibly, though, the Arctic Council's charter explicitly forbids any discussion of security issues. Those are left to individual members to resolve amongst themselves, and on this front, Russia's recent bluster is not likely to help. "These discussions about new brigades or the build-up of militaries certainly don't offer any hope," says Paul Berkman, professor of Arctic Ocean geopolitics at the University of Cambridge. "They are alarmist, and in some sense it may be self-fulfilling when those kinds of discussions emerge." So by the time Putin hosts his next Arctic summit in Moscow this September, it may be hard to keep up the pretense of peaceful cooperation. Especially with two new brigades suiting up to head north.